I admit to floundering. I’m here in the UK and so much has changed in 9 years and I’m not sure which way to be turning or quite what I’m doing and no job yet. Without setting goals in my life I swim around in circles wasting so much energy only to end up right at the beginning again. While I’m job hunting I’ve been thinking of ways to get back on track with my weight loss (BTW I jumped on the scales this morning to see that I am now up another 9 lbs since August 6 which now puts me at 279 lbs) and making theoretical plans for the future so if I can’t get regular employment I can maybe get through by doing part-time work and also become self-employed to some extent. I’m no stranger to cutting expenditure right back to the bone and already I’m tightening the purse strings. I have made a few frugal purchases though, to motivate me and keep my goals and ambitions to the forefront.. 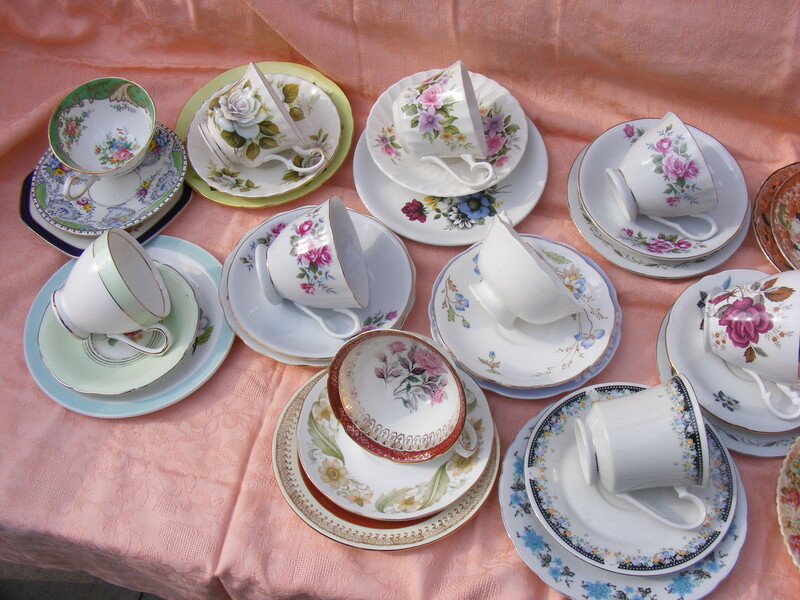 Thanks to ‘Cookaholic Kate’s’ early morning e-mail I am now the proud owner of a set of mis-matched vintage trios off eBay.. 12 sets for £12! Ideal to squirrel away in the cupboard for my current dream of a 1940’s pop-up supper club. 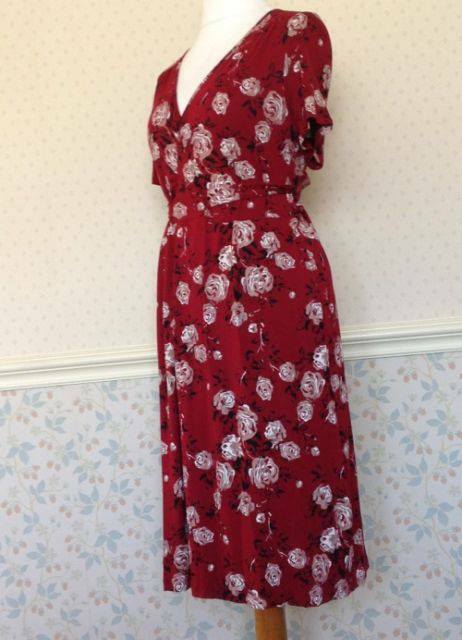 And having lived in old t-shirts and yoga pants for 20 years, without a glimpse of a calf muscle or shapely ankle (OK in my case CANKLE) I spotted the most wonderful classy vintage style dress that I immediately fell in love with. Of course at the moment there would be no way I could squeeze my bottom into such a thing of beauty, even with the most brutal corset in the world, so this is my goal, my motivation and something that I could wear within 3 months if I work hard at it. I’m happy in yoga pants and old t-shirts, padding around in bare feet but I’ve lost the feminine me over the years of child rearing and just coping with life. I want to occasionally look in the mirror and see pretty things, and ankles and a hint of a cleavage and feel good about myself. Our brave home front ladies did that. Amidst all their hardship (how can we ever really appreciate what they truly went through) they did their best to get dressed up on occasion and wore their red lipstick as a badge of courage, despite what life threw at them. It’s time to take a lesson from these amazing women. This entry was posted in Uncategorized and tagged 1940s dress, 1940s pop-up restaurant, 1940s supper club, 1940s underground, 1940s vintage tea set. Bookmark the permalink. Well Carolyn, All I can say is well done. You’ve gone home, You’ve put a roof over your head. Your looking for work and thinking about starting a home business. That’s a lot of get up and go there. When someone puts in as much effort as you are only good things will follow. You are an inspiration. Best wishes to you and the future. You are beautiful already! But you are right that dressing yourself up can go a long way in lifting your spirits. maybe a ruffly, feminine, everyday top to go with those yoga pants is in order? i know it makes me feel better – even if i’m just cleaning the house – to wear a cute top i found at a thrift store. best wishes for you in reaching your goals! Aaah wow, what a beautiful dress. I was inspired to lose 2 stone to get into a gorgeous new pair of jeans. But the dress is better motivation and would look good hanging in your bedroom somehow to brighten it up. I don’t think you need a ‘boot up the botty’, by the way, having just given yourself one in your post. I totally agree that it’s good idea to remind ourselves of the hardships women went through in the 1940s. The ‘red badge of courage’ was symbolic of all that they endured. I love those teacups, so pretty and the dress too. I definitely think the red lippie is in order, every day, mind! Been struggling too on the weight front, but I’ve started keeping a food diary and it seems to be working a bit. I made macaroni cheese yesterday for lunch, your way, yummy. Weigh in day today and I have lost the first two pounds over the first week. Just hoping it will stay away. Keep calm and carry on, as they say. Secretly, I just know you will succeed, for you surely deserve to. Amen to that post! I have been slowly losing my femininity to frumpy pj bottoms and grubby t-shirts……..shame on me! That gorgeous bit of 1940’s frill wouldn’t fit me either right now, but it sure would be a great inspiration to get me moving in the right direction! I hope it (or a full colour picture of it) is hanging on your bedroom wall to tempt you into fitting into it! I shall be looking for something similar to hang on my bedroom wall! Well i don’t wear skirts! So no motivation there for me 🙂 Closest to that is a kilt… but I do use you Carolyn for motivation. And thinking about how I once looked. With your food as a guide and reading posts on here since coming home from UK holiday in a little over 3 weeks I have lost 13 pounds now. The exercise and a much more manual lifestyle, (using washing machine etc,…a lot less) I am finding the change not so hard. I understand how difficult it can be moving back to the UK, many things have changed. You have lots of people routing for you, and we all have times when it seems difficult, so just know you’re not alone in the struggle. Love the dress… It’s heavenly 🙂 there are some great on line bargains I’ve been able to pick dresses up for as little as £5.00 if you shop around. The chinas lovely, I live in chesterfield where they have fab market days, and there’s some great bargains to be had, the train goes from Nottingham to, a return fare isn’t much at all. We just watched a documentary called Generation Jobless and it was very interesting. Particularly the explanation as to why there are so few full time jobs available and why there are so many people applying for each. We have several friends who were job hunting (some for many months now) and they all ended up deciding to stop hunting for full time and apply for part time positions – taking more than one if necessary. Two are now employed with more than one job but working up to full time hours and one has just one job but is still looking. The fourth got a short term contract and then went to a full time interview and was hired. He said that he thinks he made a great impression because he was no longer so stressed since he actually had some money coming in. He no longer had that air of desperation. When he said this it reminded me of a time when I was job hunting. He is right. Once I had a part time job I was much more relaxed at interviews and I eventually did get a full time job.